Disclosure / Disclaimer: I received this book, free of charge, from Quirk books, via edelweiss, review purposes on this blog. No other compensation, monetary or in kind, has been received or implied for this post. Nor was I told how to post about it. Knit me into a cocoon…help me eat a burrito…pretend to be a chair at my dinner party…wrestle a komodo dragon…race me in a lobster suit. Author Kelly Mahon posts absurd gig ads online, and shares the conversations she had with the brave souls who wanted the job. We’re living in a gig economy. But would you respond to an online ad seeking someone to search for escaped ants? Or take an offer for a free tattoo by someone who “needs the practice?” How about a mattress for sale “tainted by geriatric love” or a workout plan that involves throwing Virginia hams? And if you hit reply, and the poster is sketchy about the details or offers to pay you with a gift card for clams, how long would you keep the conversation going? When NYC copywriter Kelly Mahon started posting weird, fake gig ads as a creative outlet, she found that there was someone interested in every bizarre offer she came up with. And the subsequent awkward email threads were equally hilarious and bizarre. 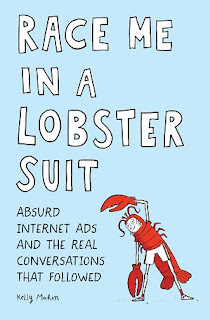 Race Me In A Lobster Suit collects Mahon’s funniest fabrications, plus the hysterical email conversations that followed as she ratcheted up the crazy. While some respondants become suspicious, others seem willing to play along with the joke. And don’t worry, everyone involved agreed to share their emails in the book, so there are no hard feelings. In a world where it seems like everyone’s suspicious of everyone else, it’s nice to know that there are still people who will at least consider helping a stranger reenact a recurring spider nightmare, or explain the principles of pig Latin to a baffled mother of three. Wow, you just can't make this stuff up can you? From the quirky posts, to the unbelievable responses, this book will have you laughing from the first story! Though you may wonder at the state of humanity with some of the responses... 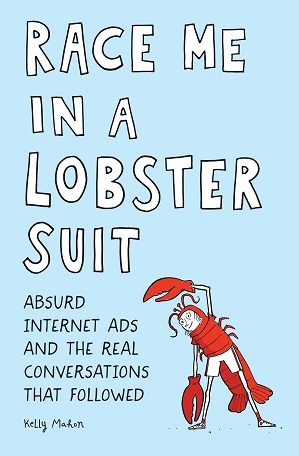 But like other reviewers, I found this book to be funny at first, but somewhere about the middle of the book, you realize people are are just looking to make a quick buck, and maybe weren't all that serious. And the ongoing prank just gets 'old' after the 20th one. I can see why editors thought it would be a funny book, but it could have been half as long. It's good for checking 1 or 2 out a time, of giving as a gag book though. Kelly Mahon is an advertising copywriter based in New York City, where she works at the digital agency 360i. From NYC, Kelly still lives in Brooklyn.